While they sport an impressive visage complete with bulbous eyes and a mouth full of spiny teeth, an anglerfish’s most famous feature doesn’t exactly belong to the fish itself. The small glowing bulb that hangs from a stalk growing out of the female anglerfish’s forehead only lights up because it houses a colony of bioluminecent bacteria. As these bacteria light up, they attract potential prey and mates for the fish, although the exact details of how both organisms benefits haven’t been fully explored. Even after sequencing the bacteria’s DNA, it would seem that the relationship may be a bit more complicated than your average bit of symbiosis. Most symbiotic relationships involving bacteria fall into one of two categories. In the first, a host offers a home or other benefits to the partner organism, but that partner remains free and unchanged from it’s uncoupled counterparts. The second form of bacterial symbiosis includes significant changes to the bacteria’s DNA. Thanks to services supplied by their host, they no longer need to maintain all their own bodily functions, and can be absorbed to live in a hosts own cells. A widespread example of this kind of relationship is the chloroplasts in plant cells that are essentially cyanobacteria living as organelles in plants, enabling photosynthesis. 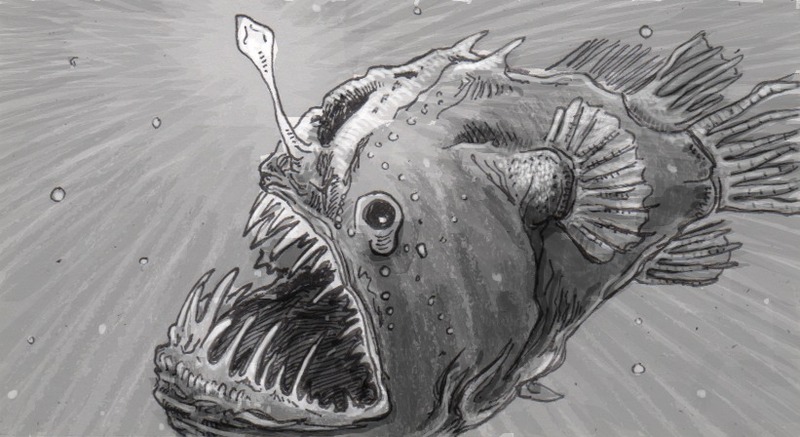 The genome of the bioluminencent bacteria in anglerfish suggests an unusual third option that seems to operate as a half-way point between the relationships described above. The bacteria have apparently been shedding some of their genes over time, but not as many as you might expect from an organism tied so closely to a 100 million-year-old fish like the anglerfish. Instead of being completely independent or assimilated, these glowing bacteria may be hedging their bets somehow, retaining some of the genes found in their free-swimming kin found elsewhere in the ocean. For example, they’ve lost the genes to allow them to detect all food sources but one. They can’t make their own amino acids, but they do still have the genes necessary to grow the tail-like appendage called a flagellum that enables other bacteria to swim through the water. Overall, both the fish and bacteria are still helping each other. The bacteria help attract things the fish needs, and the fish then houses and helps feed the bacteria nutrients they can no longer come up with on their own. Still, researchers are curious how this particular balance came to be, and if it’s still a work in progress that will eventually leave the bacteria more fully integrated into the anglerfish’s own body.